more effective, and more at peace? and ultimately, perhaps, on the whole world? — or better yet — the best possible you? Within you resides everything you will ever need to “get there” (i.e., reach your goals, be happy and fulfilled, and make your unique contribution) very quickly. My life’s work has been to help people, often very high achievers (successful business people, professionals, media figures, politicians, athletes, and creative types), identify what they see as their potential in one or more areas of their lives; and then do what it takes to make the life changes to reach that potential as rapidly and effectively as possible. This means becoming more accomplished and more successful now and in the future — as they also contribute more to the people in their lives, communities, professions, and the world. I call my system “Stage Climbing.” It’s a new way of thinking that’s already helped many people to achieve more than they had previously thought possible in their personal and professional lives. By learning this simple system, you can use it to change your life as well. It’s also a formula and roadmap to give you insight into where and how you may be stuck in a specific part of your life, such as your career, spirituality, parenting skills, or with your relationships. “Stage Climbing” virtually helps you to “grow up” (or operate as a “grown-up”), which means to identify and then use the best parts of yourself to meet any life challenge — and in the shortest time possible. My Nightingale-Conant program, The Seven Stages of Transformation: Stage Climbing to Your Highest Potential. is a “Cliffs Notes” version of the “Stage Climbing” process that’s fully described (along with the strategies for applying it to any area of your life). “Stage Climbing” gives you a fresh and clear perspective on practically any issue, from relationship troubles to a stagnant career to plummeting self-esteem to feeling disconnected from your calling, spirituality, mission, or purpose. It provides you with seven distinct and ascending views or stages that you can apply to or view any facet of your life. You then have the power to choose to stay where you are or to consciously “climb” to the higher stage more consistent with the transformation you are seeking. Stage — Stages are levels of maturity that pinpoint the degree to which you have evolved in a given life area. Think of your stages as benchmarks or plateaus. Default Stage — The stage that defines how you now typically function with respect to a given aspect of your life. Generally speaking, the higher the default stage in an area of life, the better. Target Stage — This is the stage from which you would most like to operate. When you are operating out of your target stage, you are using the best parts of yourself to accomplish almost anything! Hook — Any part of you that is uncharacteristically in a stage higher or lower than what your default stage would indicate. Gaining control over a problematic hook (via the “Stage Climbing” process) means you have solved a problem AND broken a pattern. However, not all hooks are bad! We also have hooks to our higher stages. As you will see, we optimally pass through the earlier stages at a point in our lives that is age-appropriate. However, to the degree that we have hooks to those earlier stages, issues later in life become the predictable result. Stage One — is the only possible default stage for infants, who are totally dependent on others. Hooks in Stage One as an adult generally translate to dependency in relationships as well as a variety of other issues. Stage Two — is the typical stage for toddlers, whose lives are characterized by primitive and undisciplined behavior, extreme self-centeredness, and the tendency to act out. Those who retain those narcissistic characteristics as adults, usually do it via their Stage Two hooks. Stage Three — The usual stage through late childhood is characterized by the ongoing development of conscience, learning and accepting certain rules that protect our world, saving lives, and learning about long-term consequences. Hooks in Stage Three as an adult can — at their extreme — make a person a “rigid rule abider,” unable or afraid to access one’s own uniqueness. Stage Four — This is the typical stage throughout adolescence. Your Ultimate Goal at Stage Four is to be accepted, admired, and respected by all of those who in any way matter to you, as you start becoming your own person. As an adult, living in Stage Four can result in anxiety, depression, self-doubt, and other self-esteem issues, plus alienation, shame, and a wide variety of neurotic and approval-seeking behaviors. These are the result of that constant quest for the approval and admiration of others. Stage Five — In our modern Western society, this is the typical stage for a normal adult, where we often think of ourselves as role jugglers, or the sum of all our life roles. This is the stage that gives us the best state of mind for keeping balance in our lives and taking care of logistics and essential chores. It’s also the most neutral or dispassionate stage. While that Stage Five frame of mind is important to have at times with respect to certain relationships and activities, it often results in disappointment when you expect higher degrees of fulfillment than this stage can deliver. What motivates you at Stage Five? Money, benefits, privileges, and respect from others, specifically for how you handle the roles and responsibilities of a particular aspect of your life. Is this you? Are you stuck in Stage Five? Stages Six and Seven — are the target stages that most people aspire to. As you understand Stages Six and Seven, this will become clear: by removing anything — such as the lower-stage hooks we've discussed — that block your natural drive to operate at your target stage, you will connect with your passion-driven purpose in that part of your life. You'll quickly learn how to access the zone where you are able to naturally and effortlessly operate at your highest potential. Most people view life at the target stages as life at its very best. Thus, the strategies of “Stage Climbing” focus primarily on managing or removing the hooks to your lower stages... plus accessing that source of wisdom inside of you that contains all the guidance you need to be living life at those target stages. Stage Six — Mature adult (determined not by chronological age but by the way you conduct your life) with a strong integrity and sense of self. At Stage Six, you rise above your roles, and operate according to your own unique and internally generated values and passions. This is the stage in which you love, enjoy, excel, and create in your own distinctive way. Stage Six is the first of our two Target Stages. A default stage here breaks you out of the pack, starting in early adulthood, and takes you through the prime of life and beyond. Hooks at Stage Six can begin to appear all throughout life. You are operating out of Stage Six whenever you are doing what you truly were born to do, when you are loving others in your life (or doing “labors of love” for them), being uniquely creative, or acting in accordance with your passions. At Stage Six, you feel best about yourself and are motivated intrinsically. Some Stage Six luminaries include: Thomas Edison, Isaac Newton, Galileo, Johann Gutenberg, Steve Jobs, Jonas Salk, Shakespeare, Michelangelo, Plato, Mozart, Beethoven, and Gershwin. Like these greats, we all have something of our own that we can excel at. Stage Six is about finding and living it. Stage Seven — The highest stage attainable. You are now beyond needing self-gratification and find fulfillment as a result of your benevolence and your unique contribution to others, to the world, and to how you can be an agent of change in some large or small way. Your Ultimate Goals at Stage Seven are to give back, to change the world in some way, and to have the greatest possible impact on those around you. Sevens instinctually understand this simple paradox: When you chase happiness for yourself, it often eludes you. But by helping others to find happiness, it finds you effortlessly. A default stage here in many aspects of life is certainly beyond normal and highly unusual; it would suggest an inordinately high degree of consciousness. But hooks here can also develop at any age. For instance, you are operating at Stage Seven whenever your focus shifts to a problem that does not necessarily affect you directly but motivates your desire to give back without direct benefits to you. The satisfaction that results becomes your prime reinforcer. This is certainly the best default stage from which to parent, for example. To reach and stay at the target Stages Six and Seven, follow your inner voice in whatever way you channel it. It will not mislead you. The audio program has many proven strategies to help you find that voice and to live every aspect of your life at the target stages. I encourage and challenge you to begin your “Stage Climbing” process now so that you can enjoy life to the fullest and make your unique impact on humanity and our entire world. Article by Michael S. Broder, Ph.D. 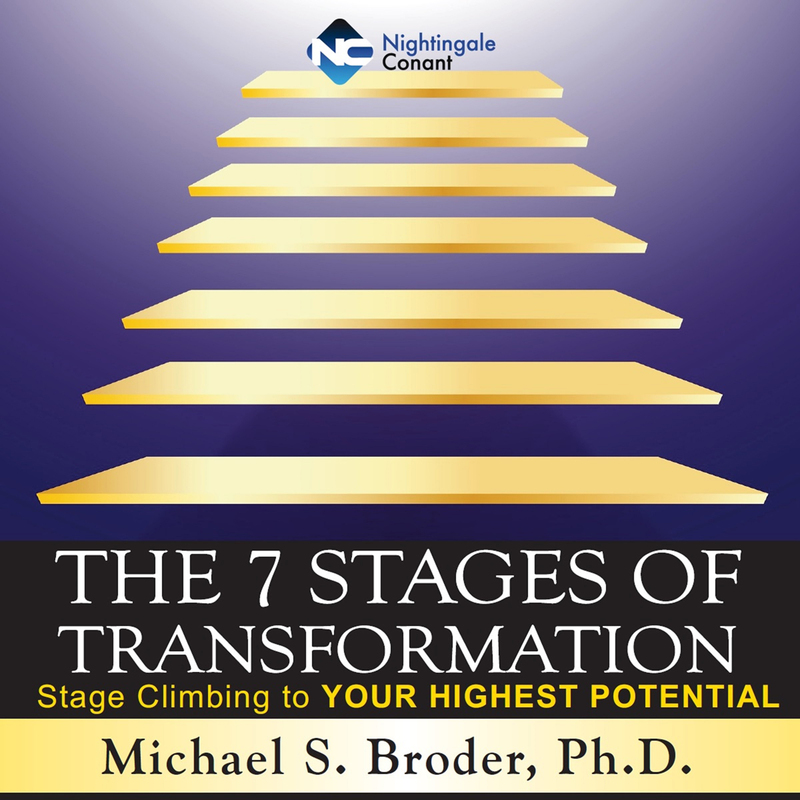 The Seven Stages of Transformation: Stage Climbing to Your Highest Potential. will introduce you to a simple yet extremely powerful process known as “Stage Climbing.” Backed by 30-plus years of research and development and clinically proven with thousands of Dr. Michael Broder’s patients and clients, this customized process will show you exactly how to understand and overcome any obstacle that is keeping you stuck and off the path to your highest potential. Best of all, it takes just minutes! In 30 days, how high will you climb? I want to move forward in any part of my life, rapidly and permanently! at the special price below. — I can select one of two ways of ordering.